A Home Health Care policy is an affordable solution that provides flexibility and financial support as you recover at home surrounded by family and friends. For as little as $12.15 monthly, a Home Health Care policy pays benefits directly to you and in addition to other NC health insurance, including Medicare. If you or a loved one has ever been faced with an accident or illness that requires skilled nursing care, physical therapy, speech therapy or other types of home health care, you know how important it is to be able to recover at home comfortably and free of financial stress. 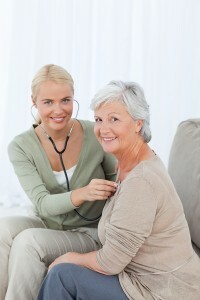 Perhaps you have aging parents and are concerned how a sudden illness or unforseen accident might affect your ability to care for them without having to admit them into a nursing home or assisted living facility. Or maybe it’s you or your spouse that could possibly need at home health care. Either way, a Home Health Care policy can help. The NC health insurance market is changing, causing consumers to look for new ways to make sure their health care needs are met at a price they can afford. For instance, there has been a marked decrease in the public’s interest in long-term care insurance over the last few years and there are many reasons for the decline. Due to more and also more expensive claims, as well as the waning economy over the last few years and the impact that has had on insurance companies, the premiums for long-term care policies have spiked, making them unaffordable for many consumers. In fact, according to the American Association for Long-Term Care Insurance the average cost of LTC insurance premiums can be as high as $3500 annually and for people living on a fixed income, that becomes difficult, if not impossible, to afford.